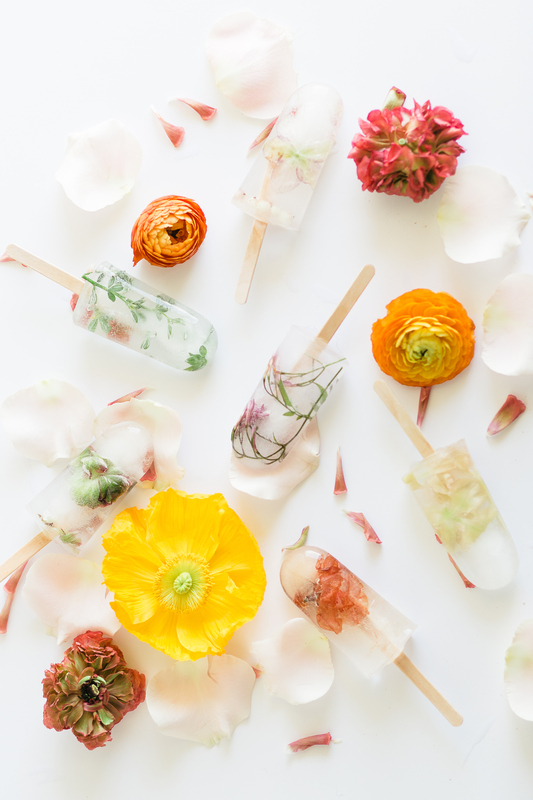 Edible Flowers – You can find these at a variety of places including online, Whole Foods or maybe just your backyard! Add your lemonade and water to popsicle mold. Submerge your flowers down in the water. Place the stick and holder back on the top of the mold and freeze overnight. Side Note: If you prefer the wooden popsicle sticks you will need to disregard using the kind that the mold provides and instead place the wood stick in the mold. Then, place the ‘mold stick holder’ through the wood stick with a rubberband at the base where the stick is coming out of the ‘mold stick holder’ to make sure the wooden stick stays submerged in the popsicle holder. Whew, I hope that makes sense! Not interested in eating them but want it for a cute display at a party? We think even the flower ‘sicles look cute in an ice bucket with drinks OR feel free to add them to your actual ice cubes.